This is an ideal device for an older user who doesn't want to get bogged down with a complicated smartphone but still wants to stay in touch. The Doro 8030 has a terrible camera, poor performance, a disappointing display, no fingerprint reader, a chunky build quality and runs on the outdated Android 5.1 mobile operating system. But to complain about this stuff really misses the point of the Doro 8030. Its purpose isn’t to compete with the best budget phones, but to provide a device that’s accessible to all. With its large physical buttons, rear-call-to-help button that sends a distress signal and intuitive interface, the Doro 8030 is a phone I’d recommend to the elderly or for your children. It’s fit for purpose and there’s no denying its target audience. Until a handset comes along that offers all of this with better performance and a lower price, the Doro 8030 is an unlikely champion. I’ve got to be honest, I liked this. It’s not the chunky, slightly ugly phone I expected. It’s fairly slim, well designed and the friendly buttons up front work well. The remote management solution is great, the Doro support is great. The additional on-screen menus and the GUI alterations are done well. It’s a nice, welcoming place to be if you’re an elderly user or you’re just someone who doesn’t take to technology well. For first-time users and seniors, the Doro 824 SmartEasy on Consumer Cellular is an excellent option. Its physical controls, clearly labeled apps and icons with step-by-step explanations, and the My Doro Manager app make for an intuitive, comprehensive experience. There are two ways of looking at the 820 Mini, it is either a rather underpowered Android smartphone that doesn’t really have any unique selling points bar the software or you could see it as a really great phone for the elderly, the technologically unsure or for a child. Doro have identified a huge range of use cases and have morphed the Android system to help the user get the job done quickly and easily. The few weeks I had the 820 Mini for were great fun, mainly for me the Android power user trying to see just what I could get it to do. Yes at times things were frustrating like with the lag at times, the unresponsiveness shortly after booting and the woeful camera. But for the market that Doro are targetting non of these issues will matter. You really won’t find an easier smartphone to use than the Liberto 820, that’s something we can’t dispute. Even the most nervous of technophobes should be able to get to grips with it, and the option to have “helpers” remotely assist you is a great touch. If you’ve been looking to move to a smartphone but were worried about things being too complicated the Doro Liberto 820 should put your fears to rest. Whether you’re considering the Doro for yourself or a loved one, the first thing to consider is how tech-savvy they are. If we set an arbitrary scale of one to ten, where ten is Steve Wozniak and one is Fred Flintstone, we’d say the Doro Liberto 820 will be a boon to anyone from levels two to four. These people will probably get the most out of the Doro’s ease of use and, if they get stuck, a helper can always step in remotely to assist. We’d still steer clear of it for total technophobes. The Liberto 820 does a lot, and despite the great job Doro has done simplifying it, there’s no getting away from the sheer volume of settings and functionality an Android smartphone possesses. For those we’d recommend one of Doro’s feature phones, such as the PhoneEasy 621. Anyone at a level of four or five and above should try a fully fledged Android, Windows or Apple iOS smartphone. iOS is the simplest to use, but Android also works well, and is much cheaper, when coupled with a simplified launcher. Doro's Liberto 820 is an excellent debut smartphone from the master of senior-friendly handsets. Android can appear horribly complex to smartphone virgins but Doro has extended almost every kind of assistance imagineable, from the reworked desktops and the bonus help features to the nifty bundled dock. As for the standard smartphone features, Doro hasn't skimped there either. The 4.5-inch screen is sharp and bright and the 8-megapixel camera is surprisingly good, capturing sharp photos packed with detail. If you have an elderly or infirmed relative who'd like a handset to get online or take decent photos, without compromising ease of use, then the Doro Liberto 820 is simply your best choice. The Liberto 810 offers a supremely accessible entry point for new users. The interface is simplistic but arguably this is one of the most successful implementations of Android yet. Too often with an Android phone, just when you’re getting comfortable, you accidentally blunder into a dark, unfurnished corner and have to fill in the gaps to find your way out. The Liberto 810 avoids this, and no matter where you go the friendly Doro interface is present. One thing that always impresses me is attention to detail, and you can tell Doro has really thought about a phone’s design and target market. The Doro Liberto 810 is full of these little touches, from the chunky USB cable to the fact that the only available font sizes are ‘Medium’ and ‘Large’! This phone has been designed with a very clear purpose in mind: to deliver the Android experience in the most accessible way possible. I found it impossible to dislike the Liberto 810, simply because it’s so good at doing what it’s supposed to do! There aren’t that many bells and whistles and it’s never going to be a fashion accessory, but it’s the simplest Android phone you’ll find and that makes it a great choice for new users. This was a total waste of money for me, after only two months it won't even take a charge. Also I could only send texts but not receive them back. Maybe I just got a defective one. But I'd be wary. I've never had any phone at any price over the year's stop working this quickly and no I didn't drop it in the lake or anywhere else! Have a Doro 824 bought March 2018. Battery discahrges 100% in 6 Hours . Tried a new battery . Same result. Doro customer service - non existent. Battery life? More like battery death. Battery died after 12 hrs even after no use at all, this is absolutely useless bought another just incase the battery was faulty but not, still 12 hours and dead. So useless it definitely is. And you can't buy a replacement battery. I've searched the internet and Doro's own site - but nix! Frustrating! Battery life is crap. 15.8 days, phah. If I use the phone by lunchtime the next day it needs charging. Every day this week so far. Not good enough. My old Samsung would last a good week+ on a charge. Rubbish battery life. Tried new battery, exactly the same. Yes, I am experiencing the same problem., fitted new battery but did not make a "gnats" difference. The display switches itself off after a pre-selected number of seconds which is hopeless as if you are not near when a call or text arrives you won't know as there is no indication visible on the screen until you unlock the keypad at some point in the future. When phone turned off it loses the emergency assistance numbers. Just a cheap basic phone as the emergency assist is no good and will not work when needed. Make sure you do not have anyone relying on this function. Purchased from O2 store. Set up and old sim inserted for me. Half an hour at home and I was competent. Good phone , good price and a great improvement on my aged Nokia. 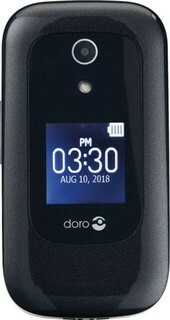 I have and my wife have had a doro 632 for over two years and it has not given one iota of trouble,battery last for as long as needed,easy to use,i recommend a payg sim no problems and if it fails within the warranty period send it back.would thoroughly this product. Visit the Doro Q&A Forum to get answers, ask a question or help others.